Crash of Wall Street on October 19, 1987. On October 19, 1987, the Stock Exchange of Wall Street closes with 22,60% of loss. It is the most important fall of its cotations in only one day of the twentieth century. In spite of that, the speculative market and the economy did not break down as in 1929. Ronald Reagan was President of USA from 1981 to 1989. 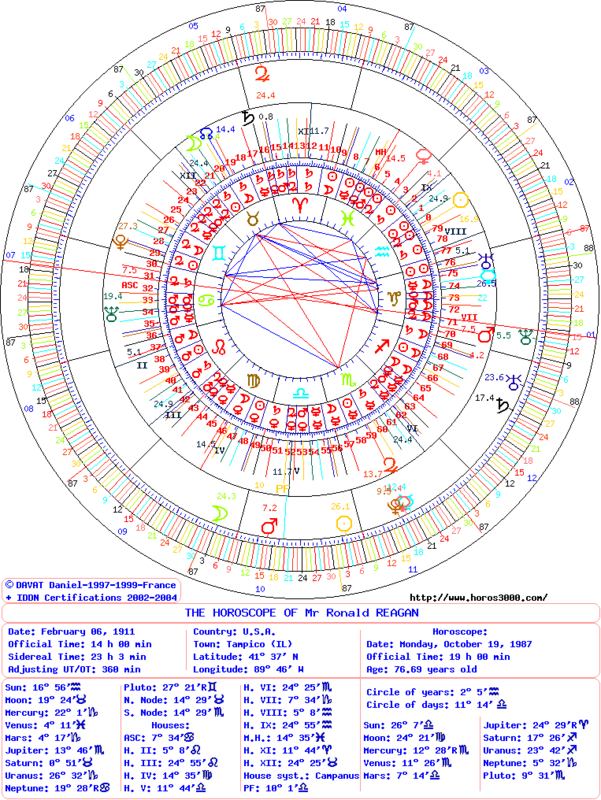 Point of convergence of the circle of the years: 2°05′ of Aquarius on a degree pertaining to Venus (4°11′), Mars (4°17′) and Saturn (0°51′). This sector has a middle force, at the end of the House VII. Position of the degree of the day: 11° 14′ of Libra that has a transit of Mars (to within 4°). This sector has a powerful force, unites with the Part of Fortune (to within 1°13′). It is also near the House V (to within 0°30′). The Sun is the master of the period. It has a powerful force and an evil quality in Aquarius, its sign of Detriment. It is situated in the House VIII, an evil house. It is the governor of the House II, that of finances. Its quality and its force announced a difficult year notably in the financial sphere. The degree of the day has a conjunction with the House V, that of the speculation. It is also unites with the Part of Fortune what is a second indication of probable important event of the financial or speculative sphere. The degree of the day has also a conjunction with Mars with a transit in Libra, its sign of Fall. It has a very evil quality. Major risks (Mars has a very evil quality) for the Stock Exchange (House V with the Part of Fortune). In fact, the Part of Fortune serves as revealing and indicates too that the crisis can be suppressed. That is what occurred because there was not economic crisis in the United States in 1987. The federal bank Reserve of the United States agreed to support the banks. This year, represented by the Sun as master of the period, governor of House II and of evil quality announced a major financial problem! This entry was posted on Friday, July 13th, 2012 at 2:24 pmand is filed under Finances. Both comments and pings are currently closed.